Sophie, Countess of Wessex is greeted by Prince Edward and her children Lady Louise Windsor and James Viscount Severn as she arrives back at Buckingham Palace having completed a cycle ride from Edinburgh on behalf of the Duke of Edinburgh's Award on September 25, 2016 in London, United Kingdom. The Countess and the other riders were presented with a Diamond Pin to mark the completion of the Diamond Challenge. What a beautiful family reception she had. Those children are precious and I love the big hug she got from her husband. I wish the Duke and the Queen had been there. What a nice welcome from her family. Note the sincere warmth in their faces when they greet the Countess upon her return home. Well done, Countess Sofie. Lovely pictures of the countess and her beautiful family. I like Sophie, she is just down to earth, sporty and can be stylish and regal looking too. 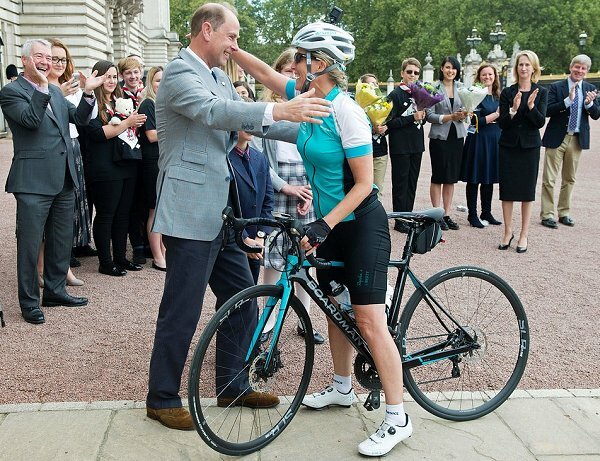 Not all royal ladies would be comfortable being photographed in cycling shorts after a creuling cycling tour, but she is. Thumbs up! 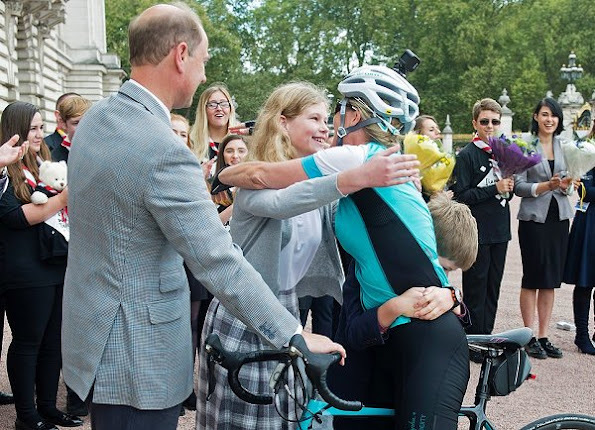 Sophie has been inspirational in her Dofe challenge ! Her family seems so proud of her ! Lovely family. The happiness and pride on Price Edward's face is lovely. How proud her family looks! As a mother of a boy I love love love the photo of a big hug from her son. Me too, boys at this age are so adorable.